The 2017 Fantasy Flight Games November World Championships start later this week! From Wednesday through Sunday, we'll be hosting hundreds of the world's greatest gamers as they compete for the year's top honors in A Game of Thrones: The Card Game, Android: Netrunner, Legend of the Five Rings: The Card Game, and Runewars Miniatures Game. 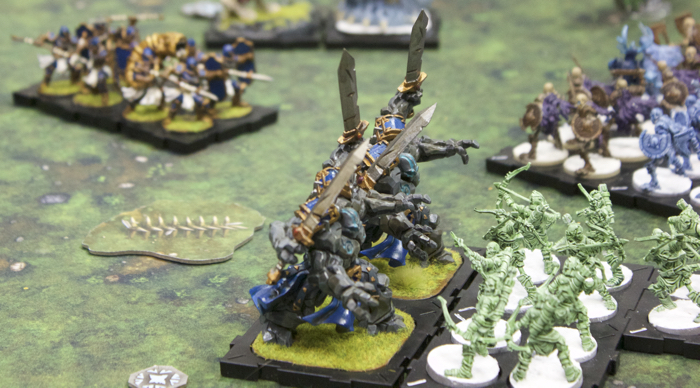 While it's too late to join the crowd at the Fantasy Flight Games Center, it's not too late to be a part of the action. We'll be streaming highlighted games live on our Twitch feed throughout the event. Download our streaming schedule (pdf, 855 KB) now, make your plans to follow along, and support your favorite players. In the meantime, you can read the new Legend of the Five Rings fiction that reveals the critical story choice facing this year's Shogun. Then you can head to our Twitter feed to offer your counsel—whether you feel the Shogun should choose the path of duty or of justice. 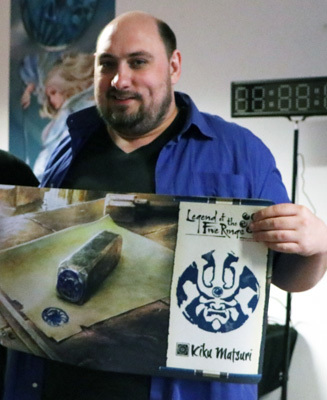 Finally, you can read on to learn how Stefan Rockensüß and Greg Young have prepared themselves for the first-ever World Championships for Legend of the Five Rings LCG® and Runewars Miniatures Game. FFG: Tell me a little about how you got started with Legend of the Five Rings and how you earned the Hatamoto title. SR: Basically it all started back when I got into Warhammer 40,000: Conquest as my very first LCG. Sadly the game ended, but I had become a great admirer of Brad Andres’s work on the game, and when I found out he was also designing for Legend of the Five Rings: The Card Game, I was easily on board, though I never played Legend of the Five Rings before. I followed all the news and thanks to a friend who recommended me as a very interested new player, I was invited to the London Honored Event. What a great surprise! I had a great time in London, and somehow managed to win all of my games, even the last, which was live streamed as I faced my nemesis—the Scorpion Clan. So I had the honor to accept the title of Hatamoto for the Crab Clan. FFG: What drew you to the Crab Clan? SR: I had a hard time deciding between Crane and Crab Clan in the beginning. The artwork and style for both appealed to me. Crane’s political and controlled style of play reminded me of the Eldar, which was my favorite faction back in Warhammer 40,000: Conquest. Crab was a lot like the Night’s Watch in A Game of Thrones: The Card Game, but with a different kind of play style. The sacrifice mechanic appealed to me a lot. In the end, I just felt the deck clicking better with Crab and decided to go with them. FFG: And how do you feel about having given your loyalty to the Crab as you look forward to the Imperial Cycle? SR: I feel pretty good about it. I am most excited about the upcoming Unicorn Talisman, which will help Crab a lot. I'm already running Unicorn as an allied faction. Also, this card reflects the story choice of the Kiku Matsuri, and that is amazing. The Crab cards that have been spoiled will further strengthen the defensive Keeper build, which I'm currently playing, so that's also great! 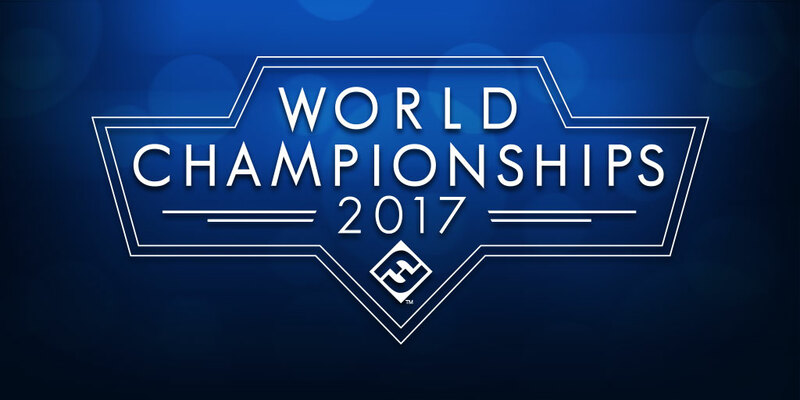 FFG: What excites you the most about this year's World Championships? SR: Meeting the community in person. Also, a lot of the old Warhammer 40,000: Conquest community switched to Legend of the Five Rings. I already met some of them in London and am looking forward to meeting more at Worlds. FFG: That leads me to another question. Since you're coming from a background in Warhammer 40,000: Conquest, I’ll ask what—apart from Brad's involvement in each—makes you feel Legend of the Five Rings: The Card Game is a good game to pursue after Warhammer 40,000: Conquest? SR: I also play A Games of Thrones: The Card Game, and Legend of the Five Rings: The Card Game is like a child of both of those games. It takes all the good things from both and merges that with the original CCG. I am very excited about the game’s story-driven elements and how the community bonds with the Clan affiliations. FFG: How do you see those Clan affiliations making themselves felt at events? SR: At most of the events right now, players are still trying to figure out which Clan to play, and I am certainly in a different situation now. I know there is a strong Crab alliance in my area, and a strong Crane alliance in another big city nearby. I count players in both of them among my best friends, and I don't think there will be any rivalry. It's just great to be part of a bigger team, chatting and puzzling on how to get the best out of the faction. FFG: Finally, have you given any thought to the type of card you'd want to design if you win? SR: Probably it would be a holding or a card that interacts with holdings. I like the concept of holdings. They are the closest things to the locations from A Game of Thrones: The Card Game and supports from Warhammer 40,000: Conquest, but they don't stay on the board very long. The Crab care about them the most, which is a perfect Clan fit for me. FFG: Anything else you want to add? SR: In general, I just want to thank you for the interview and hope to meet you all soon enough. Big thanks to the designers—Brad, Nate, and Eric—for creating such an amazing game… and to the community that fills it with life! FFG: Tell me a little bit about how you got started with Runewars. 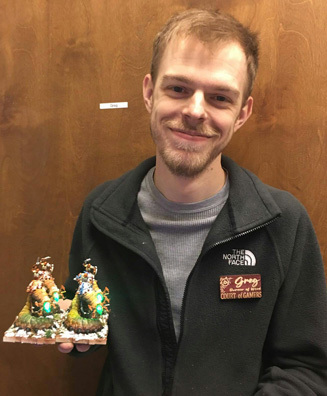 GY: I got started in miniatures wargaming about eight years ago, in Corpus Christi, Texas. I'm now living in San Antonio, where I'm a partner in Court of Gamers, a local game store here in San Antonio. I got started with Runewars about six months ago when another player dragged me into it. I've been organizing monthly play days, and playing in a few quarterly events in San Antonio and Austin. FFG: What did you and your friend find most compelling about the game? GY: The best part of the game for me is how the tray system works with the dice system. It's a great way to make bigger units feel more powerful, but also reflect the unit taking losses as trays are removed. I've played a lot of game systems that try to replicate this, but Runewars has devised a way to make it work effortlessly. Board games and RPGs have always had their place in my life as well, but Runewars is the only one that's grabbed me this strongly. FFG: Do you have a favorite faction? GY: I currently play Waiqar, but I own all of the factions. I'm incredibly excited for the Uthuk Y'llan release. I’m hoping to get a chance to snag an Army Expansion at Worlds. FFG: What excites you most about the Uthuk Y'llan release? GY: Mostly the chance to scream, "RAVOS HUNGERS!” whenever he hands out wounds at the End Phase. That, and I'm finally getting a chance to paint up a great fantasy army like a bunch of Aztec warriors. FFG: What solidified your decision to play Waiqar for Worlds? GY: One of my local players—Tvayumat on the forums—played a list he dubbed "Deathcaller Disco.” I watched him kill an entire Daqan list by Round Six without taking any damage. He and I talked about the list a lot, and we eventually decided that it had a lot of ways to handle the Daqan or Waiqar. Latari will be interesting, though; I’ve only played them four or five times. FFG: I know the game is still relatively young, and there haven’t been a lot of top-level events. That said, what can you tell me about your local playgroup and your understanding of the larger metagame? GY: Yes, I'm actively involved in the local playgroup here in San Antonio. I think our local playgroup is quite interesting. Lord Hawthorne plus Oathsworn Cavalry is rarely played here, mostly because after his prevalence at Gen Con, my group looked at each other and spent a few weeks figuring out how to counter the list. That developed into our local group maybe having a skewed opinion on cavalry. FFG: How much do you keep in touch with a wider metagame? GY: The wider metagame is an elusive thing. I'm fairly active on the forums and Facebook groups, but that doesn't always show the full picture. I think I'm taking a gamble with my list for Worlds, betting that I'll be seeing a prevalence of higher-defense, low-wound models. If I get paired into something like "Double Daqan Spearstar," it'll be a very interesting game. Someone will always have a creative list that I won't have seen, or thought of, before. Having a great list doesn't replace good fundamentals, it just enhances them. 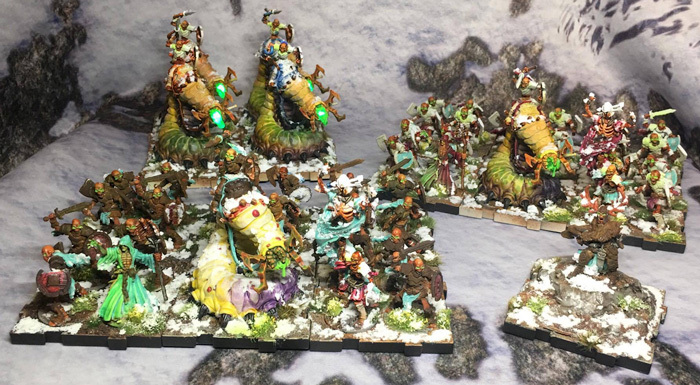 FF: You sent me photos of your newly painted Worlds army. What was your inspiration? GY: HBO's Game of Thrones. I binge-watched the last two seasons of the show while painting a Waiqar core box for a local event, San Japan. The reanimates are covered in ice and snow and are completely rusted. I found a really cool technique from a historical modeler where I actually paint iron oxide onto the model and then rust the paint with an oxidizer. FFG: What excites you most about attending Worlds? GY: Seeing the Fantasy Flight Games Center. Being an owner-partner of a FLGS, I’m always curious to see how other stores do things. 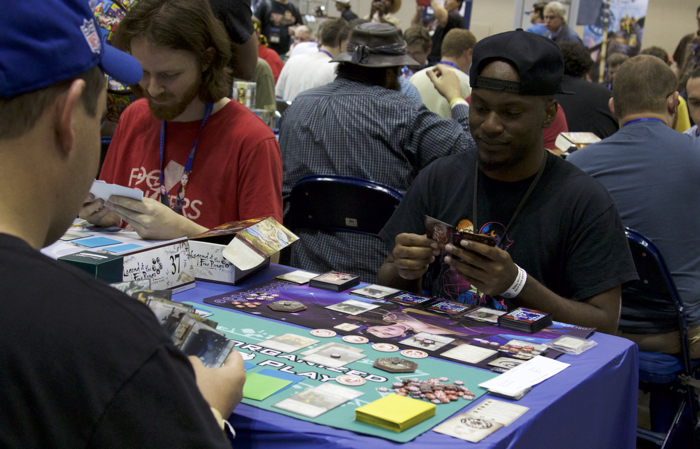 As a player, I'm mostly excited, but also nervous at meeting other players and seeing how I shake out at the event. This will be my first large-scale competitive event, and while I'm confident with my abilities and list, you can never expect the unexpected. You can only prepare to the best of your abilities. It's an exciting year for the games and communities on display at this year's World Championships. The card pool for A Game of Thrones: The Card Game has grown considerably since last year, and players have devised all manner of creative decks. On the other hand, rotation has shrunk the card pool for Android: Netrunner, and in combination with the most recent Most Wanted List's restrictions and removals, it has led to the most hotly anticipated Worlds in years. This year also marks the first World Championships for Legend of the Five Rings: The Card Game and Runewars Miniatures Game. We look forward to seeing them on our Twitch stream for the first time, we look forward to crowning our first World Champions, and we look forward to seeing how their decisions and designs may influence the games for years to come. You, too, can join in on the action. You can follow our streaming coverage on Twitch. You can read about this year's story choice and offer the Shogun your counsel via our Twitter poll. You can get an even richer sense of the World Championships experience by following our main FFG Twitter account. And you can dive deeper into the competition with the infographics and updates provided on our Organized Play Facebook and Twitter channels. In the end, our World Championships are more than competition. They're a celebration of the games and their communities. And we want you to be a part… This weekend, join us in watching the word's best games and gamers!